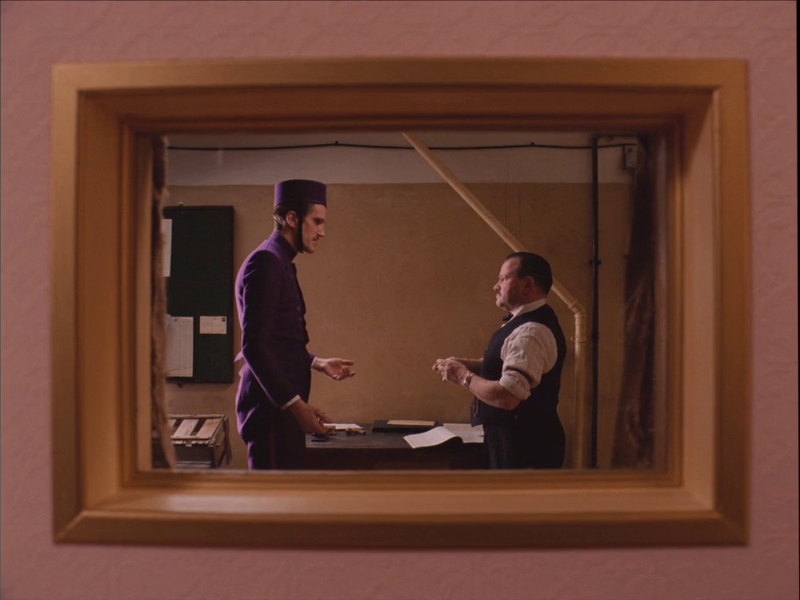 The Grand Budapest Hotel (2014) is the latest film from Wes Anderson, the man who brought us Moonrise Kingdom in 2012 and who is perhaps best known for his signature tone and visuals. His movies are often delightfully quirky and whimsical with an underlying melancholy, and they complement this mood with bright and vibrant color palettes. As we pass our halfway point for the year, I've been revisiting the films which stuck with me most. 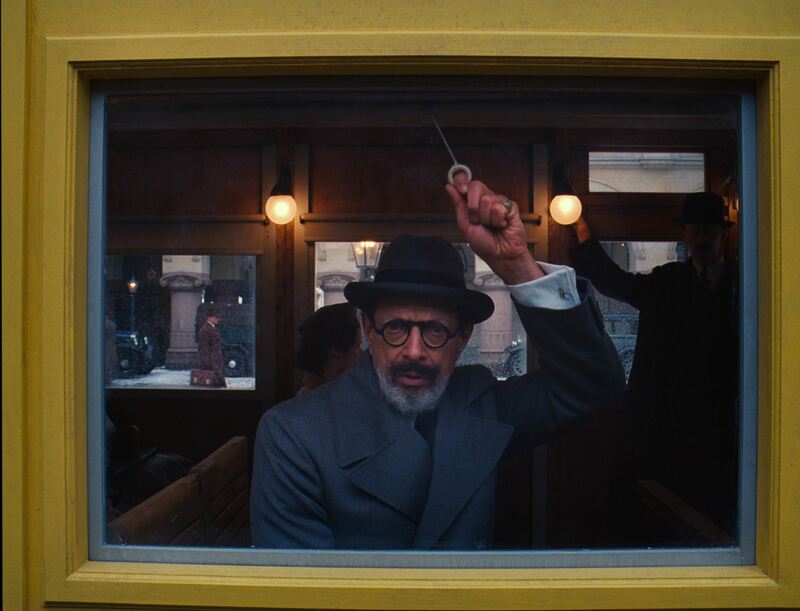 Grand Budapest Hotel is still my favorite of the year so far, and since my first review was a bit of a cop-out (even if a rather successful one by my standards) I've decided to take a look at the two central reasons why I love this movie. Surface. 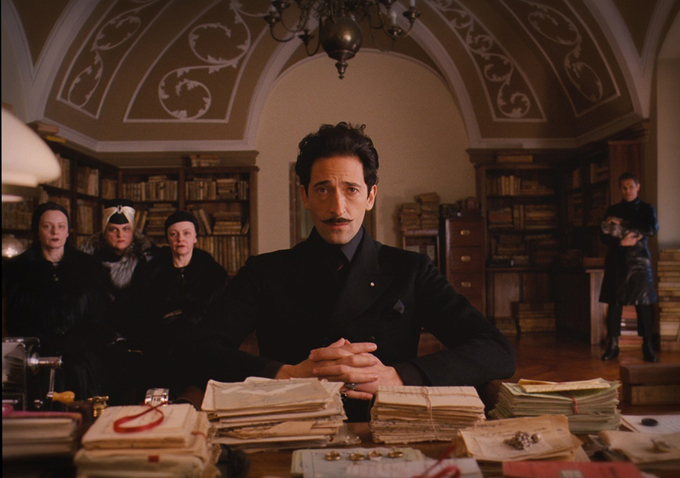 It's often unpopular to claim that a movie is worth watching simply because it has a unique visual style, but Grand Budapest is really a tour de force of a few stylistic ideas. 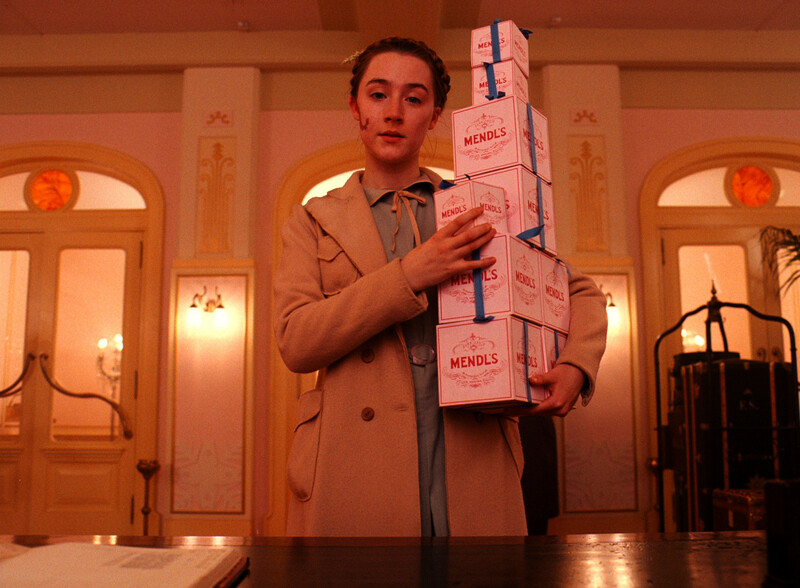 The comparison between the movie itself and the Mendl's boxes which it contains has been made before, but it's not only the textures that are similar. The the space of the movies itself is cubic and boxy, and its minimalism is sharply contrasted by the bright colors which otherwise overwhelm the screen. The camera exclusively moves in 90- or 180-degree turns. There are a plethora of 90-degree pans, and the 180-degree rule is violated constantly. This makes sense navigating the halls of the titular hotel as it is quite boxy itself, but even outside the hotel the camera restricts itself to sharp-angled movements. 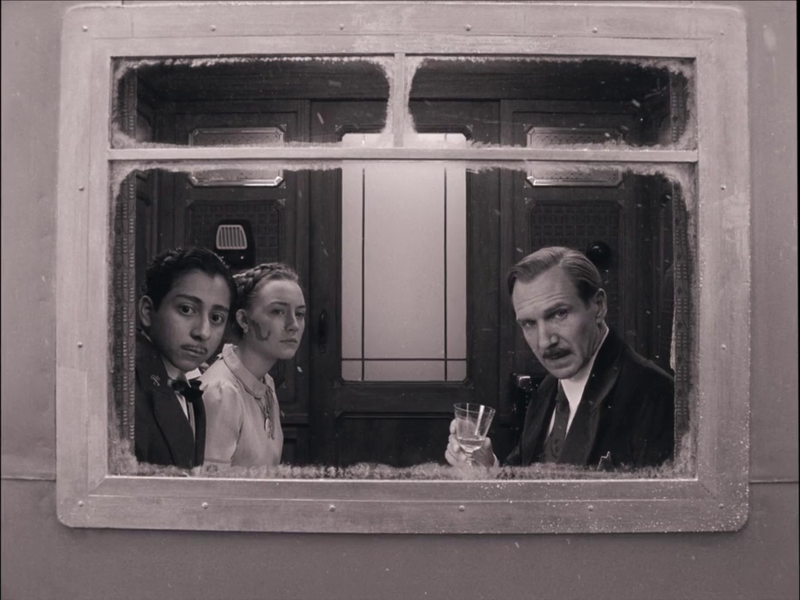 There are a few exceptions to this, like the 45-degree upward pan when Gustave is talking to the man that hired Zero and the (relatively) unsettlingly odd-angled pans during the scene where Adrien Brody discovers the absence of Boy With Apple, but for the most part it's surprisingly consistent. Even the majority of the aspect ratio for the film is trimmed down to 1.37:1 (4:3), giving it a distinctly square feeling (despite obviously not being quite square). There's also a visual motif of people talking inside of, into or out of boxes or other frames. This sounds excessively mundane until you realize how often the movie does it and how much of the screen is taken up by these inanimate framing devices. During the prison escape there's a great shot where the escapees are looking through a hole in the ground, with the surrounding ground taking up 50%+ of the screen. People are shown through windows, doors, or other openings with the surrounding wall occupying the majority of the screen (e.g. one, two, three). This builds on the consistent composition of the images which are simply centered (e.g. one, two, three; see previous examples for more) instead of following the rule of thirds. It's really quite spectacular in how un-spectacular it is, in how much it minimizes the spectacle on screen. This minimalism (both here and above in terms of camera movements) is interestingly ironic given how excessive everything else about the style is. These aspects are almost imperceptible next to the grand immensity of the color palette, and are a surprising example of restraint among excess. Substance. 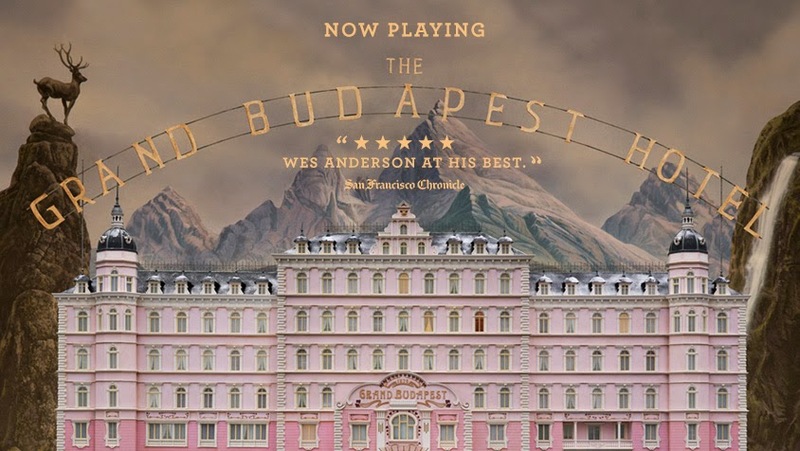 With obviously stylized movies like this it can be easy to either be overwhelmed by the visuals or emotionally check out thinking it's style without substance, but here Wes Anderson draws one of his most mature dramas to date. The film opens with the death of the author and from there continues on to contemplate issues surrounding the passage of time. The movie begins in present date and shifts gradually back to 1932. On the way, however, it moves through the 80's and 60's in order to get there. Then at the end of the movie we slide back upwards through these time frames. This narrative framing device in itself depicts the uncomfortable passage of time, as many characters who are alive in one timeline have not lived to see the others. 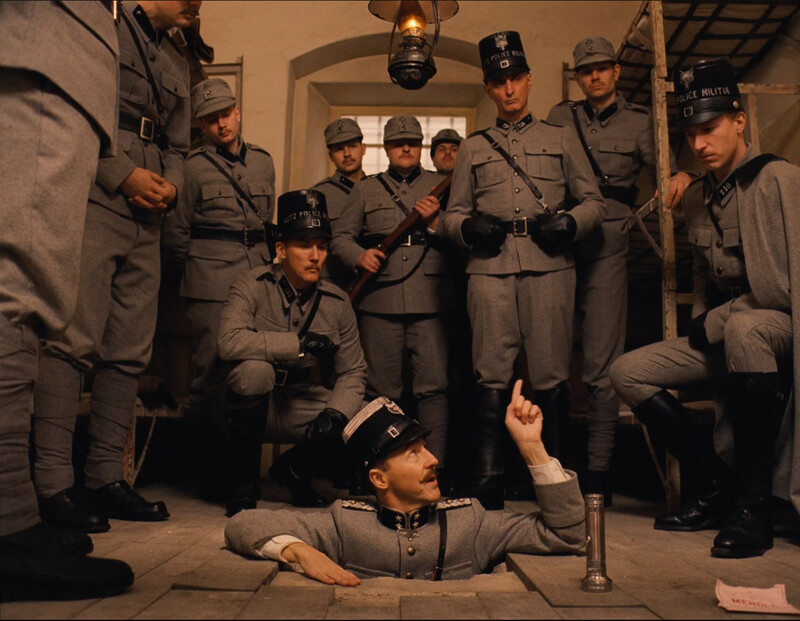 M. Gustave constantly laments the changing times and the fact that civilization as he sees it is disappearing, with the Grand Budapest being the last bastion against society's degradation. The hotel itself however also falls into disuse and fails in its role as the final wall against change. The central artwork Boy With Apple is even described as "a boy on the cusp of manhood," someone for whom the times are about to change. This provides a framework for understanding the intrusion of the war which begins in the background and ends up taking a large portion of the story. The war is first introduced immediately after we learn that Mme. D. is dead, the sign of a transition to more serious times. Toward the end of the film Zero reveals that the war is the reason he's at the hotel to begin with, that he was displaced and has become a refugee. The army gradually becomes a larger and more influential part of the drama until they end up essentially taking over the hotel itself. The hotel and the story of the film is an allegory for the way life and the world around us is changing, and how it might not be for the better.